Glenn Greenwald: U.S. Spying on Allies Shows “Institutional Obsession” with Surveillance | Democracy Now! columnist on civil liberties and U.S. national security issues for The Guardian. He is also a former constitutional lawyer. The spat over U.S. spying on Germany grew over the weekend following reports the National Security Agency has monitored the phone calls of Chancellor Angela Merkel since as early as 2002, before she even came to office. The NSA also spied on Merkel’s predecessor, Gerhard Schroeder, after he refused to support the Iraq War. NSA staffers working out of the U.S. embassy in Berlin reportedly sent their findings directly to the White House. The German tabloid Bild also reports President Obama was made aware of Merkel’s phone tap in 2010, contradicting his apparent claim to her last week that he would have stopped the spying had he known. In another new disclosure, the Spanish newspaper El Mundo reports today the NSA tracked some 60 million calls in Spain over the course of a month last year. A delegation of German and French lawmakers are now in Washington to press for answers on the allegations of U.S. spying in their home countries. We discuss the latest revelations with Glenn Greenwald, the journalist who first reported Edward Snowden’s leaks. AMY GOODMAN: To talk more about the latest National Security Agency revelations, we’re joined by Glenn Greenwald, the journalist who first broke the story about Edward Snowden. Earlier today, the Spanish newspaper El Mundo published an article co-written by Greenwald revealing the NSA recently tracked over 60 million calls in Spain in the space of a month. For the past year, he’s been a columnist at The Guardian newspaper. He is leaving the paper this week to join a new media venture funded by eBay founder, multibillionaire Pierre Omidyar. Glenn Greenwald joins us by Democracy Now! video stream from his home in Rio de Janeiro, Brazil. Welcome to Democracy Now!, Glenn. Let’s start off with the latest news from Spain to Germany. GLENN GREENWALD: Yeah, there’s a series of reports that have appeared in several different European countries over the past two weeks or so. As you indicated, there is a report this morning in El Mundo, which I co-authored, reporting that the NSA in one month, December of 2012, collected the data on 60 million telephone calls made to and from people in Spain. There was an article similar to that one in Le Monde, the Paris daily, the week before, that I also co-authored, indicating that the NSA had collected 70 million telephone calls and stored them in their system to be monitored and analyzed. And there have been a series of reports, of course, in Germany, really over the last three months, mostly co-authored by Laura Poitras, the American filmmaker with whom I’ve been working on the Snowden story from the start, about systematic and bulk spying on the people of Germany, and, more recently, targeting the German chancellor, Angela Merkel, that has caused a very significant political controversy and underscoring the principal point—is what these stories do—which is that it really is the goal of the NSA, as I’ve said many times before, to eliminate privacy worldwide by ensuring that all forms of human electronic communication are subject to its ever-growing surveillance net. AMY GOODMAN: Talk about how the German spying worked. I mean, for Germans, Angela Merkel’s phone is very famous. Can you explain why? I mean her cellphone that she uses through all sessions of Parliament. There have been pieces, whole pieces, just written about her phone, well before this information came out. GLENN GREENWALD: Right. I mean, the NSA uses different techniques. One of the main techniques that it uses, as Der Spiegel in its cover story reported this week, is, through a consulate in Berlin, the NSA sends people who pretend to be diplomats, who are actually there to engage in mass surveillance on the German population, as well as to target the individual cellphone calls of prominent German politicians such as its chancellor. We did a similar report here in Brazil on the targeting of President Dilma Rousseff. And the same has happened in Mexico, where both the current and former Mexican presidents were targeted with similar forms of surveillance. And often the way that this is done is through people who pretend to be diplomats stationed at what pretends to be a consulate, but which is really an NSA outpost that exploits its positioning in the nation’s capital under diplomatic treaties to target the population and the leading democratically elected leaders with very invasive surveillance. AMY GOODMAN: And the embassy itself, its placement, this massive embassy building that the United States moved into in 2008? GLENN GREENWALD: Right. The Der Spiegel report is using a document that demonstrates that that embassy is essentially the outpost for NSA spying. And this is quite common for the NSA to do in capitals in the allies most closely aligned with the United States. And obviously what this does is it undermines trust between these allies and the American government. It also makes a mockery out of diplomatic treaties, which really do bar the exploitation of diplomatic relations, diplomatic buildings and other forms of diplomacy as a means to engage in surveillance, both on citizens indiscriminately and democratically elected leaders, as well. AMY GOODMAN: On Friday, German Chancellor Angela Merkel demanded the United States strike a no-spying agreement with Berlin and Paris by the end of the year, saying alleged espionage against two of Washington’s closest EU allies had to be stopped. CHANCELLOR ANGELA MERKEL: [translated] I think the most important thing is to find a basis for the future on which we can operate. And as I said today, trust needs to be rebuilt, which implies that trust has been severely shaken. And the members of the European Union shared those concerns today. But we all know that we have such important tasks in the world that we can only master together and that we are responsible for our mutual security, that we simply need to look into the future. Obviously, words will not be sufficient. True change is necessary. AMY GOODMAN: That was Angela Merkel, the German chancellor. Glenn Greenwald, you mentioned, you know, the spying on democratically elected leaders. She was being spied on even before she was chancellor. GLENN GREENWALD: Right, exactly. And the current Mexican president was, as well, prior to his being elected. The United States government has created a spying system—and this is the picture that really emerges from all of the documents—that is obsessed, institutionally, with identifying any kinds of communications that it cannot intrude and then developing technologies in order to invade them, without really any thought as to the underlying rationale, a weighing of benefits and costs. It really is a spying system that exists simply to spy for its own sake, to augment the power of the United States government, to make sure that it has full understanding of what everyone in the world is thinking and doing and choosing and deciding. And that is really a very consequential—and, I think, menacing—development for the world and for the idea of individual privacy on the Internet and through telephones. And it’s up to the world, I think, to decide what should be done in light of these revelations. AMY GOODMAN: During Friday’s press briefing, White House Press Secretary Jay Carney was questioned about NSA spying of the German chancellor. NEDRA PICKLER: Thanks, Jay. I want to follow up on your comment in yesterday’s briefing about how the United States is not and will not monitor German Chancellor Merkel’s communications. Lawmakers in Berlin have objected to that answer because you didn’t say whether her communications were monitored in the past. So I want to ask you: Has the United States monitored the chancellor’s phone calls in the past? PRESS SECRETARY JAY CARNEY: Nedra, we are not going to comment publicly on every specified alleged intelligence activity. And as a matter of policy, we have made clear that the United States gathers foreign intelligence of the type gathered by all nations. As I mentioned yesterday, the president spoke with Chancellor Merkel, reassured her that the United States is not and will not monitor the chancellor’s communications. AMY GOODMAN: Glenn Greenwald, your response? GLENN GREENWALD: Remember, all of the stories that we are reporting are based on the NSA’s own internal documents, the claims that the NSA has made to itself and to its four closest allies when it comes to surveillance programs, which is the U.K., Canada, New Zealand and Australia. And so, I think at this point there’s really nobody rational who doubts the veracity of any of these reports. They’ve proven to be true in every single case. So when the documents prove or when other evidence proves that Chancellor Merkel was targeted with this kind of surveillance, it’s obviously the case that she was. And Jay Carney’s refusal to deny that she was such a target, after making a point to say she no longer will be in the future and is not right at this very second, I think, obviously, demonstrates that. That is the difficulty for the U.S. government, is there’s no way for them to demonize or to discredit the reporting that we’re doing, precisely because the reporting that we’re doing is based very faithfully on the claims that the NSA itself makes in their own documents. AMY GOODMAN: Glenn, this is Congressman Peter King, chair of the House Subcommittee on Counterterrorism and Intelligence, speaking on NBC’s Meet the Press. He defended the NSA’s spying. REP. PETER KING: I think the president should stop apologizing, stop being defensive. The reality is, the NSA has saved thousands of lives, not just in the United States, but also in France and Germany and throughout Europe. And, you know, the French are some ones to talk, when the fact is, they’ve carried out spying operations against the United States, both the government and industry. As far as Germany, that’s where the Hamburg plot began, which led to 9/11. They’ve had dealings with Iran and Iraq, North Korea—the French and the Germans and other European countries. We’re not doing this for the fun of it. This is to gather valuable intelligence, which helps not just us, but also helps the Europeans. AMY GOODMAN: That was Congressmember Peter King, who may well be running for president of the United States. Glenn Greenwald? GLENN GREENWALD: Well, first of all, are Democratic partisans at all embarrassed by the fact that the most vocal proponents of these NSA spying programs, aside from people like Dianne Feinstein, are the very Republicans whom they spent years deriding as these radicals and extremists, people like Peter King or John Boehner or Michele Bachmann, all of whom have very vigorously defended President Obama’s spying program? Does that give Democrats any pause at all about what the real value or purpose of these spying programs are? What Peter King is essentially telling the French and telling the world is that they ought to be grateful that the United States government is invading the privacy of their citizens by the millions and intercepting their communications data. And I think that message is resonating really quite poorly around the world. This is not 1982, where the United States can simply dictate imperialistically to the rest of the world what it ought to be grateful for and have the rest of the world necessarily accept it with reverence. It’s a much different world. And I think Peter King lives in that age that no longer really exists. But look, this is the claim that every power faction uses whenever they engage in mass surveillance, which is they try to tell the population, “Don’t worry. We’re doing this because we love you. We want to protect you. This is for your own good.” And in every single case when powerful factions are permitted to engage in surveillance in the dark without really any accountability—not often, but inevitably, always—it is radically abused. And that’s what makes this so dangerous. And it’s not surprising that people like Peter King are finding common cause with people like Dianne Feinstein or even Nancy Pelosi, the sort of establishment leaders of both political parties, to defend these systems, because these systems do vest those in power with extreme amounts of authority to do all sorts of things that people in power always want to do. AMY GOODMAN: In fact, Democratic Senator Dianne Feinstein is introducing legislation that would codify the NSA spying, that would grant the NSA explicit authority to gather records, listing the numbers, duration and time of all U.S. telephone calls, Glenn. GLENN GREENWALD: Right. I mean, is there anything more indicative of just how broken Washington is, that the person who leads the Senate Intelligence Committee, which is a committee that was created in the wake of the findings of the Church Committee in the mid-1970s, that was intended to serve as a restraint and a check on what the Intelligence Committee does, is the greatest loyalist and the most servile devotee of protecting and shielding the authority of that community, named Dianne Feinstein? I mean, it just shows how—what a complete joke and a travesty the idea of congressional oversight has actually become. And what the Dianne Feinsteins and the John Boehners of the world are doing right this very minute is they know that the public is outraged by these revelations, that they need to be placated symbolically. And so, what they’re trying to do is to devise legislation that, with this very Orwellian tactic, will slap the word “reform” on it and say that it’s designed to reel in some of the abuses of the NSA, but which are really—in title, are designed to let the NSA continue to do exactly what they’ve been doing, and in many cases, as you just suggested, even strengthen the NSA further. Remember, these are the people who defended, who joined together—the Republican and Democratic party leadership defended, with the White House, the ability of the NSA to continue to bulk spy on American citizens, to collect all of our phone bills, showing all of the telephone calls we make and receive. And there’s a coalition of outsiders in Washington, both on the right and the left, who are working to undermine that. But the tactics of the NSA loyalists, like Dianne Feinstein, is to produce legislation that they can deceive people into believing is reform, when in reality it does the opposite. AMY GOODMAN: In an interview on Thursday, the NSA director, General Keith Alexander, called for newspapers to stop reporting on its secret surveillance. GEN. KEITH ALEXANDER: I think it’s wrong that—that newspaper reporters have all these documents, 50,000 or whatever they have, and are selling them and giving them out as if these—you know, it just doesn’t make sense. We ought to come up with a way of stopping it. I don’t know how to do that. That’s more of the courts and the policymakers. But from my perspective, it’s wrong, and to allow this go on is wrong. AMY GOODMAN: Glenn Greenwald, that was Keith Alexander. GLENN GREENWALD: Right. First of all, what General Alexander said there—and remember, he’s probably the most powerful military official in the United States. I think everybody, more or less, agrees on that. He didn’t actually say that newspapers should stop publishing. He said something far more pernicious. He said, “We,” namely the government, “should come up with ways to stop them from continuing to report.” And he then said, “I’m not really sure exactly what ways there are, but the courts and the Congress should try and figure that out.” Now, I can’t imagine, in a minimally free country, how courts and Congress could get together and stop journalists from reporting on newsworthy stories, the way that General Alexander is calling for something to be done. I mean, if that isn’t an extraordinarily creepy and authoritarian expression of sentiment, I don’t really know what is. And to think that this is the person who Democratic loyalists and Republican authoritarians argue should be entrusted with this massive, suspicionless spying system and to control it and operate it in the dark is stunning. Who would ever trust anyone, let alone somebody who has that instinct for the government to silence journalists, with running that kind of a system? I also noticed that he said something very interesting and disturbing, which is, he sees journalists as, quote, “selling” documents. Now, selling top-secret documents, which was what he accused journalists of, is espionage. It’s treason. It’s what people like Aldrich Ames and other people are in prison for life for having done. So is that what the government, the United States government—is that the official view of the U.S. government about what this reporting is, that we are “selling” top-secret documents? That didn’t just come out of the air, that phraseology. That must be lingering somewhere. And I think it’s an extremely disturbing interview that he gave that requires a lot more attention. AMY GOODMAN: Should security officials, like James Clapper, head of national intelligence, who lied before Congress when they asked if he was spying on Americans and said, “No,” and afterward said he doesn’t know what possessed him to lie—he didn’t use the word “lie” there, to not tell, you know, the full truth—should they be charged with perjury? GLENN GREENWALD: Of course. I mean, it’s not technically perjury, because I believe that the committee chairman, before which he appeared, did not actually swear him and force him to take an oath. This is an informal practice that’s very bad in Washington. When top officials testify before the Senate, they don’t require them often to take an oath, because it’s somehow insulting to their integrity or something to ask them to do it. But whether you take an oath or not, it’s a felony under the United States code to mislead and lie to the American Congress. There were officials prosecuted under that statute as part of the Iran-Contra scandal, although many of them were ultimately pardoned and otherwise shielded. Baseball players were prosecuted under this statute for going before Congress and falsely denying steroid use. So, for the top national security official in the United States to go to the Senate and lie to their faces and deny that the NSA is doing exactly that which our reporting proved that the NSA was in fact doing is plainly a crime, and of course he should be prosecuted, and would be prosecuted if we lived under anything resembling the rule of law, where everybody is held and treated equally under the law, regardless of position or prestige. Of course, we don’t have that kind of system, which is why no Wall Street executives have been prosecuted, no top-level Bush officials were prosecuted for torture or warrantless eavesdropping, and why James Clapper hasn’t been prosecuted despite telling an overt lie to Congress. And what’s even more amazing, though, Amy, is that not only has James Clapper not been prosecuted, he hasn’t even lost his job. He’s still the director of national intelligence many months after his lie was revealed, because there is no accountability for the top-level people in Washington. And the final thing to say about that is, there’s all kinds of American journalists who love to go on television and accuse Edward Snowden of committing all these grave and horrible crimes. They’re so brave when it comes to declaring Edward Snowden to be a criminal and calling for [inaudible]. Not one of them has ever gone on television and said, “James Clapper committed crimes, and he ought to be prosecuted.” The question that you just asked journalistically is such an important and obvious one, yet not—none of the David Gregorys or Jeffrey Toobins or all these American journalists who fancy themselves as aggressive, tough reporters, would ever dare utter the idea that James Clapper ought to be arrested or prosecuted for the crimes that he committed, because they’re there to serve those interests and not to challenge or be adversarial to them. 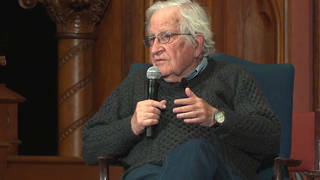 AMY GOODMAN: Interestingly, opinions are changing, meaning the pundits and writers are changing their views, like Richard Cohen of The Washington Post_, whose latest piecestory.html says, “What are we to make of Edward Snowden? I know what I once made of him. He was no real whistleblower, I wrote, but 'ridiculously cinematic' and 'narcissistic' as well. As time has proved, my judgments were just plain wrong,” he says. And I want you to respond to that and also the significance of this weekend’s protest, because I dare say what has changed is the massive grassroots response, whether it’s in the streets or just people being horrified at what’s taking place. But the significance of the rally that took place on Saturday that Edward Snowden sent a message to? GLENN GREENWALD: Right. I mean, you know, look, Richard Cohen is—has long been one of the most, I would say, trite and dishonest American columnists. He has his job because these positions have always been life-tenure positions. Once you get a job as a Washington Post columist, you keep it forever. That said, the facts that have emerged are so completely contrary to the script from which these Washington journalists were reading, all in unison at the very beginning, that he just couldn’t any longer maintain that with a straight face. Literally—I went back when I was writing my book, and I looked at all this—within 24 to 48 hours of Edward Snowden’s identity being revealed by our article on June 10th in The Guardian, countless pundits and reporters and Democratic Party loyalists were—who didn’t know the first thing about Snowden—were all singing the same song, which is that he was a fame-seeking narcissist—this was the cliché they all invoked—and wanted to damage the United States. And the facts were always so completely contrary to that. He refused every single television interview once he revealed himself, because he wanted to make sure that the focus stayed away from him personally and stayed on the substance of the NSA revelations. And as Richard Cohen finally realized and pointed out, he could have done all sorts of things with the material that he possessed, if he wanted to harm the United States or was interested in enriching himself. He could have sold it to foreign intelligence services for millions of dollars. He could have passed it to enemy governments. He did none of that. He sacrificed his entire life, unraveled his life, sacrificed his liberty, in order to inform the world about what was being done to their privacy. And so, the script, the clichés that they were all given and which they all mindlessly recited, that he was a fame-seeking narcissist, couldn’t have been further from the truth. And kudos to Richard Cohen for finally acknowledging and admitting that. As far as the rally is concerned, you know, I think there was an attempt early on to say that people in general don’t really care about privacy, don’t care about civil liberties. I’ve been hearing this for the last seven or eight years as I’ve made that my principal focus. And the fact that here we are five months later, and these revelations are every bit as consequential and are riveting people around the world as they were five months ago, just proves how true that is. The fact that there is a rally of people who are disregarding the sort of standard partisan divisions or ideological conflicts coming together—right, left, center—and realizing that their enemies are the people in government from both political parties who believe that their powers should be exercised in secret and with no accountability, really is a testament to how much privacy is valued around the world. Human beings understand instinctively why the private realm is so crucial. 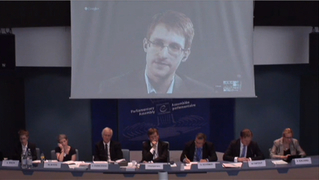 Edward Snowden is considered a hero in countless nations around the world. And it is true, of course, that there’s an authoritarian strain in American political culture that says that has anybody who defies government authority and dictate, who exposes things that government officials shall—have decreed shall be kept secret, is an evil and bad person, but this is really a fringe and increasingly marginalized view. And I think you see people use the Internet increasingly for everything that they do more, coming to see these—this surveillance system over which they have no control and didn’t know about until four months ago as being really dangerous and threatening. AMY GOODMAN: Glenn Greenwald, it isn’t—something that isn’t not talked about as much or written about as much, extremely threatening to these governments—for example, what you exposed in Brazil working with Globo, the newspaper, the spying, the—most of the media has focused on Dilma Rousseff, the president, and she refused to come to a state dinner in protest this month. But the spying on Petrobras goes to bigger point, that—since the Cold War is over, that a lot of U.S. intelligence is used to spy for corporations. And the significance of this, of what the NSA is doing? GLENN GREENWALD: Yeah, it’s a really important point, Amy. I mean, the spying on the individual leaders gets a lot of attention, in part because those individual leaders seem not to get truly angry until it’s revealed that not just millions of their citizens, but actually they themselves, are being spied on. That’s just the nature of political leaders. But the bulk of the reporting has been about two things in these other countries: number one, the mass indiscriminate spying on the populations, millions and millions of calls and emails every single day; and then, secondly, what you just referenced, which is the clearly economic espionage. That’s significant for two reasons. Number one, the U.S. government has gone around telling the world, from President Obama on down, from the beginning of these stories, that this spying is necessary and justified to protect the American people from terrorism and to preserve national security. And yet, so much of the reporting we’ve done has proven that to be an utter lie. I mean, they’re spying on Petrobras, as you just said. They are spying on the Brazilian Ministry of Mines and Energy in conjunction with the Canadian intelligence service, which just happens to oversee the industry in Brazil in which Canadian companies have the greatest interest. We’ve reported on extreme levels of surveillance at the Organization of American States or at economic conferences in Latin America designed to negotiate economic accords between countries. And so, what it’s really doing is it’s making it clear that the United States government’s claims to the world cannot be trusted, that when President Obama opens his mouth and justifies these programs, everyone now knows that what comes out of his mouth is false. And I think that’s the job of journalists in—to hold people accountable that way, but it also has serious repercussions for how American politicians are perceived in the world and what the role of the United States government is in the world. But the other aspect to it is, is that the United States government has been very vocally running around for years accusing China of engaging in espionage and surveillance for economic advantage and industrial advantage. And these revelations prove that the United States is doing exactly the same thing. And if you reveal to populations around the world that their calls are being spied on by the millions, they’ll first wonder, “Why are my calls of interest to the U.S. government?” But when it becomes apparent that the United States government is doing this for economic advantage, they start to feel personally implicated, like they’re being actually robbed. Petrobras is an incredibly important company for Brazil. It funds a lot of their social programs, and it’s state-owned. It’s a source of national pride. And people understand that the reason they’re spying on Petrobras or on the Ministry of Mines and Energy or economic conferences isn’t because they think there are terrorists or other bad people inside those institutions; it’s because the United States government wants undue economic advantage—exactly what they denied they do and what they claim only China does. AMY GOODMAN: Pretty interesting that after you testified in the Brazilian Senate, the members of the Senate put on Edward Snowden masks.